The incubation period before symptoms appear is from 2 to 14 days (most commonly 2-6 days) after becoming infected. The incubation period can be several weeks in immunocompromised people. The majority of people may not even be aware they are infected. WNV is classified according to presence and severity of symptoms. Viremia is simply the presence of virus in the blood. About 70-80% of people who are infected are asymptomatic with no obvious signs of infection. They do not feel ill or have any symptoms of infection. It is believed that these people have viremia lasting, on average, 6.5 days. Most people will not be aware they are infected but may be identified through screening, such as when they donate blood. The incubation period for WNV infection is from 2-14 days. About 20% of people infected with WNV have mild symptoms including: Mild symptoms may persist for days or weeks, but most commonly last 3 to 6 days. This condition is referred to as West Nile fever. An uncomplicated infection is usually characterized by fever of sudden onset (>102.2 F/39 C), often with nausea and vomiting. The rash that is associated with WNV usually appears 3-7 days after the onset of symptoms, along with the onset of fever. The rash usually persists for 7 to 14 days. The rash may begin on the back of the arms and trunk and then spread across the torso, face, and limbs, usually sparing the palms and soles. Typically the rash, as described by Gorsche and Tilley, is erythematous, diffuse, and painful, but doesn’t itch. The rash consists of discrete, irregularly-shaped macules and slightly elevated papules 2-6 mm in diameter. The rash blanches with finger pressure and some papules are tender to the touch. The frequency of rash associated with WNV has varied somewhat. In New York and New Jersey in 2000, 16% of patients (3 of 19) had a maculopapular rash, and in an outbreak in Ontario in 2002, 27% of patients (17 out of 67) had a similar rash. WNV should be suspected in any patient presenting with a similar rash. About 31% required hospitalization for an average of 5 days. At 30 days after onset of the illness, 63% of respondents continued to have symptoms. Among the 72 patients who normally attended work or school, 57 (79%) could not attend because of illness, and had a median absence of 10 days. The results of this study suggest that there should be more follow-up for patients with West Nile fever after the acute phase of the disease. Most people experience no symptoms after the acute phase of West Nile fever. In the United States 0.45 per 100,000 population infected with WNV will develop severe neurological symptoms, such as WNV-associated meningitis, encephalitis and/or acute flaccid paralysis. West Nile virus has resulted in the largest arboviral meningoencephalitis epidemic documented in the Western Hemisphere and the largest reported epidemic of West Nile related viral encephalitis. In 2015, 45 states and the District of Columbia (DC) reported 2,282 cases of domestic arboviral disease. Among these cases, 2,175 (95%) were WNV disease and 1,455 (67%) of those were classified as neuroinvasive disease (meningitis, encephalitis, or acute flaccid paralysis). The national incidence of WNV neuroinvasive disease was 0.45 cases per 100,000 population. Because arboviral diseases continue to cause serious illness, maintaining surveillance is important to direct prevention activities such as reduction of vector populations and screening of blood donors. The Los Angeles County Epidemiology Report #13 of October 26, 2017 announced that, there were 222 WNV cases with 16 deaths and 12 asymptomatic donors during 2017. This surpassed the 153 cases and 6 deaths documented in 2016. WNV meningitis is a typical aseptic viral meningitis with low mortality. 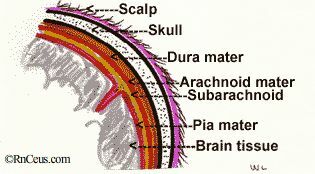 Meningitis is an inflammation of the pia mater and arachnoid membranes which envelop the brain and the spinal cord. It accounts for 20% to 30% of the central nervous system symptoms associated with the virus. The most common symptom is severe headache and fever with back pain, myalgias, and rash in 20% to 50%. Neck stiffness and photophobia occur in 19% to 27%. People should be hospitalized to rule out other causes, which might be more readily treated. Some meningitis progresses to encephalitis. WNV-associated meningitis is a typical aseptic viral meningitis. 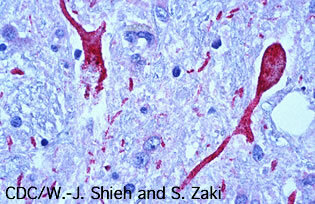 Photomicrograph of brain tissue from a West Nile encephalitis patient, showing antigen-positive neurons and neuronal processes (in red). Two-thirds of WNV cases with serious neurological involvement manifest as encephalitis or meningoencephalitis. Encephalitis is an inflammation of the brain tissue. It presents multiple symptoms suggesting central nervous system impairment, including headache, fever, weakness, nausea and vomiting. Seizures are uncommon. About 15% of WNV encephalitis cases will progress to coma. Muscle weakness is a prominent symptom and may involve AFP progressing to respiratory failure. Symptoms have varied in different outbreaks. In Louisiana, in 2002, patients with WNV encephalitis presented with movement disorders, including tremors (often accentuated with movement), myoclonus, and parkinsonian features of cogwheel rigidity, hypokinesia, and postural instability. Several patients had hyperreflexia and bulbar findings, including cranial nerve abnormalities, dysphagia, and altered oculocephalic reflexes. 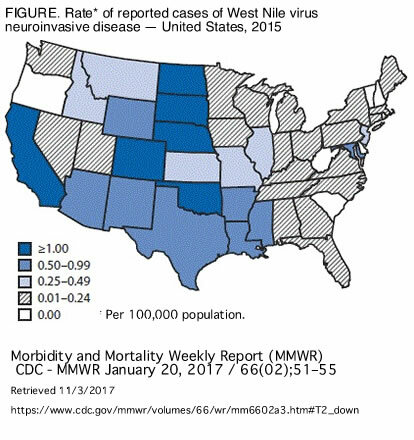 Overall mortality rate for those with WNV encephalitis range from 4% to 14%; however, death rates are higher for elderly patients. WNV-associated encephalitis can result in coma and death. Acute flaccid paralysis (AFP), is characterized by the acute onset of muscle weakness in limbs and/or respiratory muscles. Severe symptoms may last several weeks and can result in permanent neurological deficits or death. AFP characterisitics are similar to the poliomyelitis syndrome caused by polio virus. Poliomyelitis involves inflammation of gray matter in the spinal cord, often resulting in paralysis and respiratory failure. WNV related muscle weakness and paralysis are thought to be caused by viral destruction of cells in the anterior horn of the spinal cord. Other nerves are at risk. WNV is thought to be involved in the demyelination of peripheral nerves resulting in an illness similar to Guillain-Barre syndrome. Cranial nerves can be affected resulting in facial palsy, dysphagia and optic neuritis. 5 neuromuscular respiratory weakness, not requiring intubation. 1 with acute respiratory failure requiring intubation. Of the 12 patients with acute respiratory weakness, 3 died, 2 were still on chronic ventilation, and the median duration of intubation was 66 days. Early dysarthria and dysphagia were consistent with impending respiratory failure. It’s important for healthcare providers to recognize that symptoms of AFP can occur without meningitis or encephalitis or even headache or fever. There may be few clues other than weakness to suggest the patient is suffering from severe WNV infection. Researchers do not yet know the long-term effects on patients. WNV-associated AFP syndrome is similar to that caused by the polio virus. Sejvar JJ, Bode AV, Marfin AA, et al. (2005). West Nile Virus–associated Flaccid Paralysis. Emerging Infectious Diseases. ;11(7):1021-1027.